The Entrance Hall at Attingham: The columns are part of the original interior designed by Steuart and formed an open colonnade until 1805 when the wall between was added. The micrographs illustrated below right show samples from the later wall (top, with two distinct schemes and a chunk of plaster) and from one of the original walls (bottom, with four distinct paint layers and a small piece of the substrate). The top two layers of the original wall match those of the later wall. Most people will be familiar with the use of paint analysis to identify early schemes of decoration. Paint analysis is often undertaken so that an interior can be redecorated as it would have first appeared, or as it would have appeared at a particular point in its history. However, paint analysis can achieve much more than this. It is also used to discover how a room or a series of rooms evolved, how different architectural elements within them relate to one another chronologically, as well as how a room functioned or even how it was perceived by those who used it. In short, architectural paint analysis is a useful archaeological tool for exploring the past. Paint analysis carried out at the three properties discussed below illustrates its potential. Historic houses are often the product of more than one period of construction as they expanded to meet new requirements and were adapted to meet new fashions. Interior decorative finishes are even more vulnerable to changing tastes and it is rare for historic interiors to retain their original decorative finishes. Internally, the result of this continual change in a room is a series of decorative schemes, one on top of another. Beneath the paint, architectural elements may be of different dates, including repairs and alterations, without any visible evidence of the change. In the same way that an archaeologist can examine layers of earth at a dig and identify the artefacts found within each datable strata, the paint analyst can chart the evolution of ornamentation and structural changes using samples of wall decoration. Instead of layers of dirt, the analyst examines layers of paint for the information they contain. This method of investigation is possible in part because it is known when some of the materials used in decoration were introduced or invented. For example, if emerald green, a pigment which was not discovered until 1814, is identified in a layer of paint, this would tell the analyst that the paint stratum which contains it can be no older than 1814. It may also be possible to date some paint layers where contemporary accounts survive, such as a letter describing a room, an architect’s proposal, or a decorators’ bill. However, documentary sources are not always reliable: architect’s proposals may not be carried out; and even descriptions of a room often differ from one person to another. Nevertheless, documentary research forms an important part of the paint analyst’s work and often provides vital information. For example, documentary research may uncover a description of the room in 1825 after it was newly painted green. This might suggest that this green decoration is the same green identified under the microscope. If the description also includes the appearance of the doors, ceilings and remarks on the introduction of a new chimneypiece the analyst can really start to understand how all the paint layers of the various architectural features sampled relate to each other. Paint analysis carried out in this way can be very useful in determining when architectural elements were introduced or altered within a room as an element added later is likely to have fewer paint layers (although the lack of early paint layers on one element may also mean a repair or that the piece was stripped prior to repainting). The status of a room can also be deduced by identifying the decorative materials used: the more expensive the pigments and finishes, the greater the importance of the room. Many stages are involved in the paint analysis process. Typically it starts with a visit to the site in order to gain an appreciation of the room or series of rooms involved. At this point the opportunity can be taken to devise a brief for the analysis with the client. The more specific the brief, the better able the analyst is to tailor the investigations to the client’s requirements, reducing the number of samples required and the cost of the project. It is usually best to carry out the documentary research before taking samples in case there is any information that shows which areas are most likely to produce the information required and which are later additions. Where specific dates can be given for particular alterations, the first paint layer identified on the altered element might provide a useful benchmark for dating other elements within the room. The documentary research may also provide contemporary descriptions. If the identification of a particular scheme – perhaps a stencilled or gilded decoration – is sought, these may give the analyst an idea of where it might be most likely to survive. Because it is important to know exactly where each sample has come from, samples are best taken by the analyst, usually with the aid of a scalpel or dental drill. Whoever takes the sample, it is most important that each one is numbered and stored separately, and the original location of each sample must be carefully recorded on a drawing or photograph immediately after it is taken. Each sample usually includes a small piece of the substrate so that there can be no doubt that the sample contains the first layer. On returning to the studio, the samples are set in polyester resin and polished to expose a cross-section through the paint layers for examination under an incident light microscope (a microscope designed for use with reflected light). During this stage of investigation the ‘stratigraphy pattern’ and the materials used in the various samples can be charted and compared. The opportunity can also be taken to subject the samples to micro-chemical tests to aid in the further identification of materials, including both pigments and media. Polarising light microscopy can also be a useful tool because certain datable pigments are readily distinguished under this type of light. More sophisticated analytical equipment can also provide powerful aids if the materials found in the paint strata cannot be identified by the first three methods or if further verification is required. For example, while simple micro-chemical tests are capable of establishing whether a paint layer was oil based, they cannot determine the type of oil employed or the nature of many other materials sometimes included in the mixture. Useful processes include scanning electron microscopy, Fourier transform infrared spectroscopy, and gas chromatography – mass spectroscopy (GCMS). Once an understanding of the stratigraphy pattern has been established including any datable materials, it is important to revisit the documentary research already undertaken. Only by marrying up the historical findings with the analytical findings can a full understanding of the development of the room be established. Paint analysis carried out for the National Trust at Attingham Park, a fine Regency country house near Shrewsbury, illustrates how later alterations can be distinguished by comparing the stratigraphy of painted surfaces. Attingham Park was designed by George Steuart in 1782 for Noel Hill (later the 1st Lord Berwick). The building was fronted by a large central portico which led directly into the Entrance Hall; from here the visitor could pass through a magnificent colonnade at the far side of the room into a top lit staircase. Twenty-three years later, in 1805, this colonnade was filled in by the 2nd Lord Berwick to create the Picture Gallery in the space formerly occupied by the staircase. The scheme, which was designed by John Nash, included the creation of a new circular staircase behind the Picture Gallery. Evidence that the wall leading into the Picture Gallery was introduced as part of the John Nash alterations was given by illustrations and written records. This documentary evidence was then substantiated by analysis of the painted decoration. Three initial light cream decorations were recorded on all the walls of the Entrance Hall except for the wall leading into the Picture Gallery. 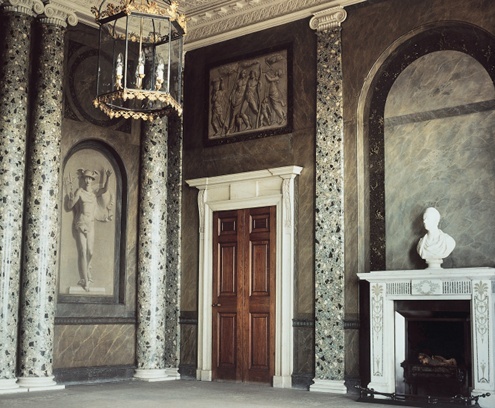 The first decoration noted on the Picture Gallery wall – a grey marbled decoration – corresponded with the fourth scheme on the other walls. The examination and comparison of stratigraphy layers in this instance was useful in a number of ways. First, it gave an idea of the original appearance of the room when first designed by Steuart as well as two subsequent decorations. Second, it allowed the Nash scheme, which related to the introduction of the new wall into the room, to be pinpointed. By doing so it was possible to establish that the Nash alterations in the first decade of the 19th century coincided with the first marbled decoration in the Entrance Hall. Paint analysis was also useful in determining when the grisaille paintings were introduced to the Entrance Hall. 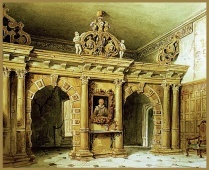 The paintings were inserted into panels and niches created by Steuart in the 1780s. However, the paintings were smaller than the niches and an area had to be filled in and papered over to accommodate them, suggesting that the paintings were late arrivals. It is this papered area which was examined and found to retain only marbled decoration and none of the earlier schemes. This would suggest that the grisaille paintings were inserted as part of the Nash alterations in the room. Finally, analysis was useful in determining the marbling techniques and materials employed by decorators at Attingham Park in the early part of the 19th century. In this instance the samples record an intricate accumulation of paint and varnish layers which resulted in a complex and beautiful Regency decorative finish. Norfolk House, St James’s Square, London was designed between 1748 and 1756 by Matthew Brettingham the elder for the 9th Duke of Norfolk. On its completion, the Duke and Duchess held a grand opening: its Rococo interior caused a sensation in London, and many accounts survive describing its decoration. The Norfolk House Music Room at the Victoria & Albert Museum: Nobody suspected that the fine joinery of this exquisite interior, which is now at the Victoria & Albert Museum, was anything other than original 18th century craftsmanship until paint analysis carried out for the Museum showed that the joinery could not be older than 1816. Only the carving is likely to be the original. Shortly before the demolition of the building in 1938, the interior structure of the first floor Music Room was given to the Victoria & Albert Museum. Three of its walls were re-erected in the same year and have until recently been on display in the Victoria & Albert Museum, London. The room was dismantled in 1998 and stored in preparation for its conservation and redecoration as part of the new British Galleries at the Museum, and the opportunity was taken to carry out a study of its decoration. This project is a good example of how the identification of a datable pigment can radically alter our understanding of a room’s development. 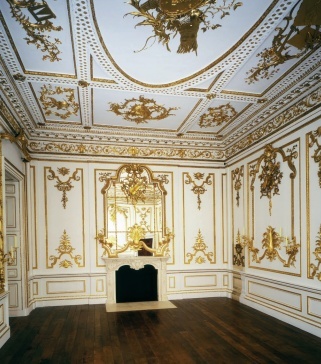 Analysis of the Music Room revealed evidence of up to seven off-white decorations on the ceiling and joinery together with over seven gilding applications. At the commencement of the project it was assumed that the joinery was part of the original design. However, analysis of the paint layers on the joinery gave everyone a surprise. The pigment cobalt blue was identified in the first scheme to survive on the timber and in the second phase of ceiling decoration. Cobalt blue was only discovered in 1802 and in England it was being used in the execution of fine art by 1816. Obviously, this date does not correspond with the interior designed by Brettingham in the 1750s when, according to contemporary accounts, the joinery was painted white. Although over 100 samples were taken from the joinery and analysed, no trace of their earlier paint layers was identified on any of them. As it would not have made sense to have had all the 18th century joinery systematically stripped of its decoration, it is more likely that the majority of white painted joinery was replaced prior to the second decoration. Wholesale replacement of large areas would have been a lengthy undertaking and was presumably required as a result of some major problem. Whatever the cause of the problem, it seems likely that only the joinery had to be replaced, as the more expensive finely carved mouldings appear to retain evidence of the primary scheme, such as priming and undercoats, implying that they were indeed original. During transfer of the room to the museum it was noted that grooves had been chased into the walls at Norfolk House which bore no relationship to the joinery fixings used. In the past it has been suggested that this mismatch indicated that a dado has been used initially, with a frame above for wall hangings. However, in the light of paint research it may be that the altered position of fixings was simply the result of joinery replacement. 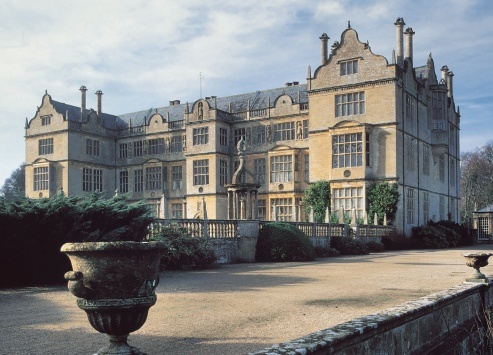 In 1999 the National Trust initiated a programme of historical research into the architectural development of Montacute House, an Elizabethan manor house in Somerset. Paint analysis was seen as an important component of this research. The National Trust had taken over the management of the property in 1931 and it was unclear how much of the original decorative schemes had survived under later decorative applications, or the dates when certain architectural elements were introduced into the house. Montacute was constructed by the Phelips family in the 1690s. The importance of Montacute House lies in its completeness as one of the least altered examples of Elizabethan architecture in the country. Nevertheless, alterations were made, the first major programme being in 1786 when, in a bid to create a corridor to interconnect the rooms internally, the entrance was repositioned on the west facade and ornamental stonework brought from nearby Clifton Maybank House, a mid 16th century house, was re-erected and placed into the space formed by the wings at either end. Further alterations followed in the 19th century particularly in the 1820s and in the period 1845-52. The building then fell into a long period of decline which lasted until it was eventually acquired by the Society for the Protection of Ancient Buildings in 1931 who passed it on to the National Trust. Perhaps not surprisingly, paint analysis showed that a considerable degree of paint stripping had been undertaken at Montacute: only eight schemes of decoration remained in many of the rooms. Fortunately, sufficient evidence survived to allow Montacute’s 19th and 20th century decoration schemes to be pieced together from paint samples and documentary evidence. At Montacute, analysis was also a valuable tool in determining how rooms functioned as well as how they developed. For example, it showed that the walls of the Screens Passage and the Great Hall were treated in a similar fashion throughout their surviving decorative history. In turn, this suggests that these two rooms were viewed as one space and may have been occupied as such. Paint analysis was also helpful in forming an understanding of how rooms were seen and treated by their occupants. In the Old Kitchen a total of 15 decoration schemes were identified, all executed in inexpensive water-based distempers. Although this was a greater number than generally found in other rooms at Montacute, it was still insufficient for a building constructed in 1601. Furthermore, the identification of the pigment French ultramarine, which was invented in 1828, in the first decorative scheme indicates that the paintwork is no older than this date. Bearing in mind the ease with which distempers can be removed, the loss of early schemes in the kitchen is not surprising, and the accumulation of layers may simply be due to regular repainting, perhaps for sanitary reasons. Thus the investigation demonstrated that the kitchen area was painted more frequently and in less expensive coatings than the grander spaces in the rest of the house, illustrating how paint analysis can be used to gain an understanding of the status of a room and the more functional manner in which some rooms were treated. The three paint analysis projects outlined above show just how useful paint layers are as an archive charting the history of the development of an interior and the way rooms were seen and used. However, the importance of this archive is easily overlooked and painted surfaces are regularly stripped in refurbishment schemes, destroying the information they contain. So please think carefully before reaching for the paint stripper in any historic building! LISA OESTREICHER is both an architectural historian and an analyst of architectural paint, having studied at the Architectural Association and the Victoria & Albert Museum. She now runs a specialist paint analysis consultancy for historic buildings.